The free online teacher resources that follow have been invaluable to me, and I hope that you will find them to be useful as well. I have deliberately not listed an enormous number of sites, choosing to focus on what the sites have to offer and what I have used them for. I would NEVER recommend websites, software, or any other resources that I have not personally tried myself. Important Note: Site images below are linked to their targets. Some sites have not yet converted from htttp to https, and for each of those sites, the URL is shown below the images. Before I list these websites and a brief description of each, I would like to begin with a cool online teacher resource that does NOT involve going anywhere other than Google. The Wonder Wheel is not really a website--it's an alternative way to perform a search using Google. Actually, I didn't realize that this option was available until just a couple of years ago. 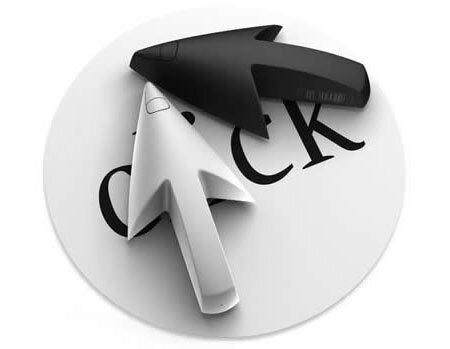 Instead of search results being presented in a table of clickable links, Wonder Wheel displays a webbing graphic (see above) that changes more and more as you refine your search. If you are not familiar with Wonder Wheel, you can access it at any time you are performing a search on Google's website. Simply type in what you're searching for in the regular search box. Then, click on the Wonder Wheel link on the left side of the screen under the "All results" section (shown here at the right side of your screen). 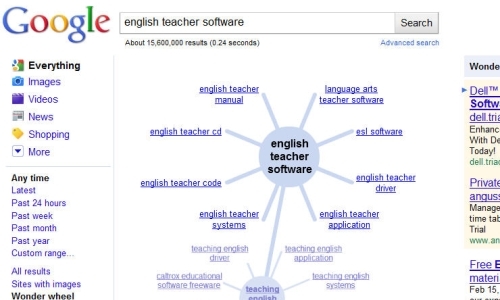 Your search results are then presented in the form of a spoked web graphic, such as the one you see above when I searched for "teaching software". To me, it's sort of like mind mapping, which I have always found intriguing. I have used this with kids in the classroom to brainstorm information about relevant topics. I display the results of our search as it proceeds via my digital projector for everyone to see. Finally, this search approach often helps me to narrow my search in more useful ways. The spiders analyze students' answers and present individualized book recommendations. I give students credit for reading books when they successfully complete a quiz. Kids can take the quiz a second time, but they can't cheat. The second quiz is entirely different! This site is one of the best places on the web for kids to find information about their favorite books, series, and authors. Here they will find reviews of the latest titles, interviews with their favorite authors and special features that promote the "fun" aspect of reading, including trivia games, word scrambles, and contests. At Twin Lakes, students were required to read 25 books in an academic year. To support that effort, I used the resources available here along with those available at bookadventure.com (mentioned above). Additionally, I required students to complete author studies. This site features excellent brief biographies of lots of kids' favorite authors along with their interviews. KidsReads.com served as both a vital reference for my students and a motivating celebration of reading. This site, sponsored by the International Reading Association and endorsed by the NCTE, offers classroom resources, professional development opportunities, parent and afterschool resources, and loads of free stuff. Here you can get lesson plans for any grade level and tons of student interactives. The student interactives are what I like best about this site. They adapt particularly well to the digital projector. Some sample interactives include writing poetry and prose, organizing and summarizing, learning about language, and inquiry and analysis--to name just a few. The graphics present themselves extremely well on the classroom projector screen. They are instructive and motivational--students clearly enjoy collaborating on projects using these resources. 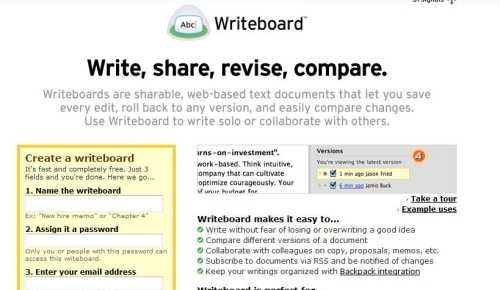 Writeboard is an online word processor specifically designed for collaboration. A document can be created and then shared with a group of users who may make changes--deletions, insertions, and edits. Previous versions of the document can be recalled if necessary. I had my kids collaborate to demonstrate the importance of reading. Each of my classes was divided into six groups. I gave each group a portion of the alphabet. Group number one's task was to brainstorm all of the things that we read that begin with the letters A, B, or C. Group two had D, E, F, and so forth. We used Writeboard to compile each group's list from all five of my classes into the master list. If you're curious, I will post what they came up with in the very near future. Students are presented with quizzes in the categories of math, English, geography, chemistry, art, and language learning. For each answer students get correct, the people behind this website donate 10 grains of rice To the United Nations World Food Program. If students answer correctly, the next question is more difficult. Wrong responses are followed by easier questions. This is one site that students using my classroom computers were authorized to visit. Additionally, when I took my classes to the computer labs to take assessments, students with "down time" could visit this site. Kids love the graphics of the rice bowls filling up, and it's a very worthy cause! Here you will find audio books, contests, educational games, printables, and educational website reviews for kids, teachers, and their families. There are lots of resources for all subject areas as well as snippets of HTML for the classroom website. This site offers free HTML for websites (under the widgets tab). I have used their Daily Factoid, Jokes by Kids, and Game of the Day on my classroom website. These widgets are aimed at kids and update daily. There are additional widgets available also. This site features teaching resources, lesson plans, printables, strategies, ideas, and books. Additionally, there is a collection of 50 student interactives that require anywhere from 15 to 30 minutes to complete. Except for the books, most of the stuff offered here is free. Once again, the student interactives are what I like best about this site. They adapt very well to the digital projector and the graphics are clear and motivational. Some of them are best suited for individual student use, but many of them can be adapted to use with the entire class. This is a free homework information portal that features homework-related sites organized by grade level and content area. A team of students, parents, teachers, and their team of educators, librarians, and journalists have made an impressive amount of resources available here. For the most part, homework that I typically assign to students is usually in the form of independent reading or online academic activities. As a result, I really do not use this site. My colleagues in other subject areas, however, recommend this site regularly to both students and their parents. Anything you ever wanted to know about PowerPoint is located here. This site features help, templates, add-ins, how-tos, links, tips, and more. All of the content is located in categorized FAQ lists-- everything from creating your own PowerPoint themes to using menus, links, and coding to enhance your presentations. I use PowerPoint presentations quite frequently, and I have found this site to be informative and useful for putting together presentations that really capture kids' attention and interest. In my opinion, the information presented on this site is more comprehensive than the help information presented in PowerPoint itself. Actually, what its name says above pretty much says it all. "This is a free graphics generator for web pages and anywhere else you need an impressive logo without a lot of design work. Simply choose what kind of image you would like. Then, fill out a short form and you'll have your own custom image ready to download." I use this site quite a bit for generating text and logos that I feature on all kinds of things, including signs, posters, and classroom labels. For example, the Daily Teaching Tools logo that appears at the very top of this page was created with the cool text graphics generator. Visit extraworksheets.com (http://www.extraworksheets.com/index.php) for free worksheets in core subjects for all grades: history, science, math, English, and elective classes. Find free printables for elementary and high school classes--great teaching resources for concept review, substitute teachers, and home-schoolers. Coolteacherlinks.com has resources for high school and elementary teachers: classroom ideas, contests, reference tools, webquests, national libraries, and cool teaching tools. "My name is Alyssa Lozano, and I work at a community center. A member in our youth programs, Sophia, has been volunteering to help us with computer workshops for the younger kids. She came across your page and found it to be helpful. Thank you! Sophia also found this excellent article which shares a great deal of information and ideas for kids using computers. Since we found this article to be so helpful, Sophia would like to suggest it to you to add to your Online Teacher Resource page as an additional resource. She thinks your visitors would really like it. Also, it would be very motivating for her to see her suggestion on your page! Please let us know if you do decide to add it because Sophia would like to show her peers and family, and possibly share it in a workshop." Alyssa and Sophia--I'm DELIGHTED to share this with my visitors! I'm hoping that others will find this inspirational, and as a result, share links that they have found to be valuable. I sincerely hope that you will find some of these online teacher resources helpful. Additionally, I am quite sure that ALL of you have your own favorite online resources. Would you consider sharing them with all of us?